In 1981, the Soviet Union and their Polish puppets, in reaction to the growing Solidarity Movement in Poland that threatened the Russian grip in Eastern Europe imposed martial law to turn back the clock on progress. When the Solidarity Union Leader (and later Polish President) Lech Walesa was arrested, he told the arresting soldiers “this is the moment of your defeat. These are the last nails in the coffins of Communism” Walsea was prophetic as the Iron Curtain fell eight years later. The Republican-controlled Arizona State Legislature, and in the Nations Capital for that matter, after losses in the 2018 elections, show they realize that their actions suppressing the rights of the people reflect the gasps of a dying political movement. 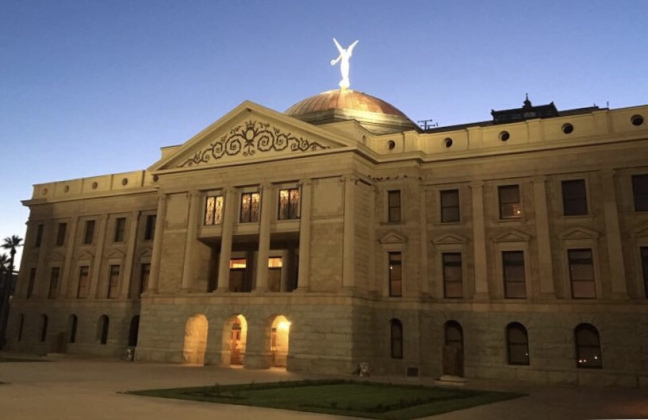 Two months into the2019 Arizona legislative session, it is clear that Republicans in the State Legislature did not learn from their defeat in 2018. Rather than searching for compromise with the energized Democrats, their legislative members (among them Michelle Ugenti-Rita, Kelly Townsend, Vince Leach and John Kavanagh) are making one last attempt to turn the clock back on progress by adopting measures on strict party-line votes that hinder voter registration, stifle the initiative process, make clean elections cumbersome, put up barriers to emergency voting, make schools unsafe by allowing firearms on school grounds, suppress what teachers can say in the classroom, and hurt our young people by reducing their minimum wage. One of their legislators (Mr. Leach) asked the Attorney General’s office to look into nullifying a Tempe ordinance (passed with 91 percent support) that would require campaign disclosures of donations over $1,000.00. They also obstructed opportunities for members, and third parties, to speak and advocate for passage of the Equal Rights Amendment. Public servants who suppress the opportunities for people to vote and do not safeguard their civil rights and safety are not true public servants. The Republicans in the 2017 Arizona State Legislature imposed restrictions on the initiative process. The people overcame those obstacles and if it were not for a packed Ducey Supreme Court and the very biased Secretary of State office headed by Michelle Reagan, the Invest in Ed and Outlaw Dirty Money Initiatives would have made the ballot and been approved by the voters in November 2018. The voters responded to this Republican attempt to suppress their rights in 2018 and Democrats took three State House Seats, two State offices (State and Public Instruction), five Congressional districts, and Jeff Flake’s Senate Seat. The people overcame in 2018 and, knowing that Republicans are not interested in compromise, they will overcome again in 2020 and 2022 with more dynamic and progressive candidates and activists re-entering (and entering for the first time) the political arena, working hard for every vote by convincing them that their forward vision for Arizona is superior to the reactionary-turn back the clock prescriptions the current majority party offers. The Republicans know they are on borrowed time and that is why they are putting as many obstacles in place as they can to stop people from exercising their rights as Arizonans and Americans. This is the last gasp, like those of the Soviets in the 1980’s, of a dying political movement to influence the agenda and the people will overcome the reactionary attempts to take away their rights.